Kathleen’s employees don’t earn points for speed. The focus is on quality. 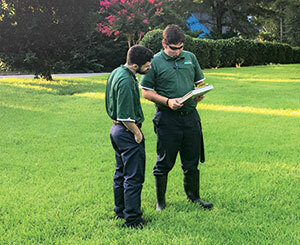 Michael Rogers strives to manage growth while maintaining his Georgia-based lawn care company’s small-town roots. Michael Rogers has never told his technicians to work faster. Instead, he encourages them to spend as much time on each client’s property as necessary to do the job right the first time. Perhaps it’s a reflection of his southern roots, or maybe it’s just his way of doing business, but this slow and steady pace works for the president of Kathleen’s Lawn & Ornamental Pest Control in Evans, Ga., who has always appreciated quality over quantity. This philosophy is the backbone of Kathleen’s Lawn & Ornamental Pest Control, or Kathleen’s for short. Since launching in 2006, the $600,000 company has strived to grow without letting go of its small-town identity. The company keeps it simple—with practices like issuing hand-written invoices and referencing the Old Farmer’s Almanac to help predict next season’s weather—while delivering services to its 60 percent residential, 40 percent commercial clientele in more than 20 counties throughout eastern Georgia and western South Carolina. Kathleen’s, which does 85 percent lawn care, 10 percent shrub and tree care and 5 percent pest control, is also a subcontractor for several of the area’s larger landscape maintenance companies. Kathleen’s services are designed to improve the health of the soil, Rogers says. The company uses the organic plant probiotic Holganix. For 20 years prior to becoming Kathleen’s, the company operated as Rogers Services and offered landscape maintenance and lawn care. But six years ago, Rogers, who has been a licensed chemical applicator since 1992, decided to sell the maintenance side of the business and focus primarily on lawn care, which intrigues him more. To differentiate the new lawn care business, the company now does business as Kathleen’s Lawn & Ornamental Pest Control with its signature ladybug logo. Named after his wife, who doesn’t work in the business, Rogers says the name presents the company in a softer, less industrial light and is easier for customers to recognize and remember. Rogers says there was a lack of lawn care companies that did more than just “throw down iron or nitrogen,” and he wanted to offer services that focused on improving the health of the soil. His interest in the scientific side of lawn care led him to an organic plant probiotic product called Holganix, which he says uses a diverse list of beneficial microorganisms, microbial food sources and organic additives to build strong roots and grow healthier, more resilient plants, balancing the soil’s ecosystem. The company uses a bridge system of Holganix and synthetic fertilizers. It also practices integrated pest management. So far, the company has done just that. Clients’ lawns look so good that Kathleen’s has experienced 90 percent growth through word-of-mouth marketing and customer referrals, Rogers says. Other than a website, Facebook page, yard signs and truck wraps embellished with the company’s recognizable ladybug logo, Rogers does not buy in to traditional marketing methods. He particularly dislikes the postcards many companies use, which he says “slam” homeowners’ mailboxes January through March. The company gives customers $25 gift cards for referrals, and it has no intention of competing with larger companies that are more focused on price. 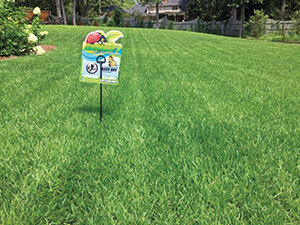 Rogers is quick to point out that a great looking lawn requires participation from the homeowner. His technicians spend time educating customers on how to water and mow their lawn based on the time of year. Their efforts, combined with the products and the company’s expertise, are what keeps their lawns green and healthy year-round. Rogers doesn’t hesitate to walk away from customers who don’t hold up their end of the bargain. Such a relationship would be a waste of time and money for everyone involved, he says. 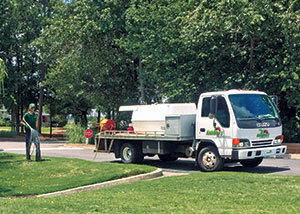 Kathleen’s educates employees, who in turn educate homeowners on proper lawn care. Education is ongoing at Kathleen’s, both in the field and in the office. In addition to teaching homeowners how to properly care for their lawns, Rogers holds weekly meetings with his staff to make sure everyone is on the same page. The company enforces a strict policy that any concern reported by a customer will be checked out within 48 hours. Being informed and prepared helps his staff stay on top of potential problems. Like many lawn care operators, Rogers cites pesticide regulations as one of his company’s top challenges, and he spends a lot of time testing and researching new products. He says he’s lucky the Augusta region has not yet faced fertilizer restrictions, but he continues to see chemicals being taken off the market, and he often has difficulty finding adequate replacements. Going forward, Rogers wants to continue to grow in the Augusta market, while never losing site of what has made his company successful—honesty, loyalty and patience. Learn about an additional service Kathleen’s offers during The Masters in this web extra.